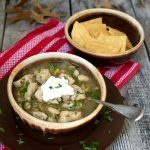 This is a delicious white chili with creamy white beans, juicy chicken in a savory broth and finished with a touch of lime, a dollop of sour cream and a sprinkle of chopped cilantro. In a large Dutch oven or heavy pot, sauté onions in olive oil on medium high heat until tender, about 4 minutes. Add the garlic, cloves, cumin, Sazonador (or salt) and cook a minute more. Add the green chilies, dried oregano and serrano chili (if using). Add the chicken pieces, chicken stock, and bay leaves. Increase the heat to high and bring to a simmer. Lower the heat to low and cover. Simmer for 20 minutes, until the chicken is thoroughly cooked. Add the drained canned beans and cook for an additional 15 minutes. Taste and add more salt if needed. Serve topped with a squeeze of lime, a dollop of sour cream, sprinkle of chopped cilantro, and tortilla chips. ** Goya's Sazonador is a Spanish complete seasoning we like to use. You may use Kosher salt instead.